If you made the first circuit, you may have quickly come up against the major flaw - you have to know Morse Code to use it. 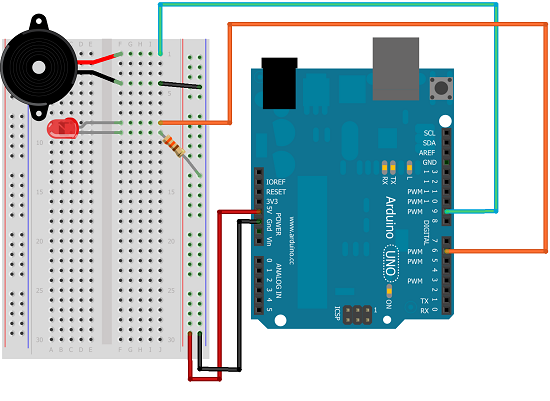 This project uses a simpler version of the same circuit and allows you to enter text to be encoded into Morse Code. This is a pretty simple circuit to set up. The piezo buzzer has a marking on the underside showing which of the pins is positive. There is quite a lot of code here. The constants at the start define the pins, the tone we are using and the gaps between elements of the code. In the setup procedure, the pinmodes are defined and Serial communication is started. The dot() and dash() procedures are used to make it clearer when writing out the code. The soundLetter() procedure converts a given character to its Morse code equivalent. The order of the cases is chosen to match the frequency of letters in written English. In the main loop, any lower case characters are converted to upper case. Anything else is treated as a space. To use this properly, open up the Serial Monitor (CTRL + SHIFT + M). Set the Baud Rate to 9600, type in your message and press SEND. This program is incomplete. There are codes for digits and for punctuation. You could add those. You may also want to check the performance of the circuit against an online converter or mobile application.